John E. Steel, age 80 of rural New Richmond, WI, died on Saturday, January 19, 2019 at Regions Hospital in St. Paul, MN. John was born the son of Edwin and Faith (Tyrrell) Steel on September 30, 1938 in Mankato, MN. He moved to the New Richmond area as a teenager and graduated from New Richmond High School with the class of 1956. John was married to Roberta Forrest on October 10, 1959. He spent a number of years as the City Street Commissioner for the City of New Richmond. He later worked as a heavy equipment operator for T.A. SCHIFSKY & SONS, INC. John also farmed and was very proud of his Purebred Poland China Hogs. He served on the St. Croix County Fair Board, the St. Croix County Rodeo Board, and the National Poland China Association Board. 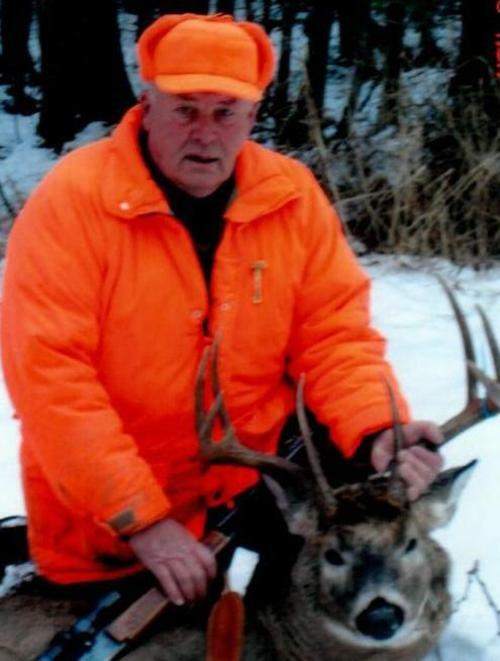 He enjoyed hunting, fishing, camping and spending time with his grandchildren. John like to show pigs, go to fairs, and was big fan of John Wayne. He was a straight talking, honest man. He is preceded in death by his parents, Edwin and Faith Steel; infant son, Michael; and brother, Michael Steel. John is survived by his children, David Steel, Thomas (Jill) Steel, Cathy Smith; grandchildren, Jennifer (Joseph) Willett, Nicole (Andy) Oman, Tristan Steel, Megan (Marcus) Hugo, Michael (Danielle) Steel, Alexandra (Victor) Redus; great-grandchildren, Grace, Shailee, and Ellowyn Willett, Heather Oman, Camden and Marie Hugo, Alyse Steel, Bradley Smith, Angel Redus; brother, Gary (Shannon) Steel; former wife of 53 years, Roberta; and many nieces, nephews, relatives and friends. Mass of Christian Burial was held on Thursday, January 24, 2019 at 12:30 pm at St. Patrick’s Church 1880 County Road G in Erin Prairie, WI. Visitation was on Wednesday, January 23, 2019 from 4- 8 pm with a prayer service at 7:45 pm at Bakken-Young Funeral & Cremation Services 728 S Knowles Avenue New Richmond and on Thursday from 11:30-12:30 at the church. Interment will be in St. Patrick’s Cemetery in Erin Prairie at a later date. Arrangements are with Bakken-Young Funeral & Cremation Services.